This past year, Roger Kjelgren, MREC’s center director, was awarded an American Association for the Advancement of Science’s (AAAS) Leshner Fellowship. We had a chance to chat with Kjegren about his experience as an AAAS Leshner Fellow so far and how this experience has helped shaped his position as the center director of the UF/IFAS Mid-Florida Research and Education Center in Apopka, Florida. The focus of the AAAS Leshner Fellowship is to connect the science world with society to enhance public engagement and understanding of the importance of research. What have you learned so far from your AAAS Leshner Fellowship? That public engagement is a step beyond science communication. I had previous experience as a Jefferson Science Fellow in a distilling science message to a lay audience. The Leshner fellowship emphasizes engaging the public in a dialogue so you the scientist is more able to see the world through the eyes of your listener. 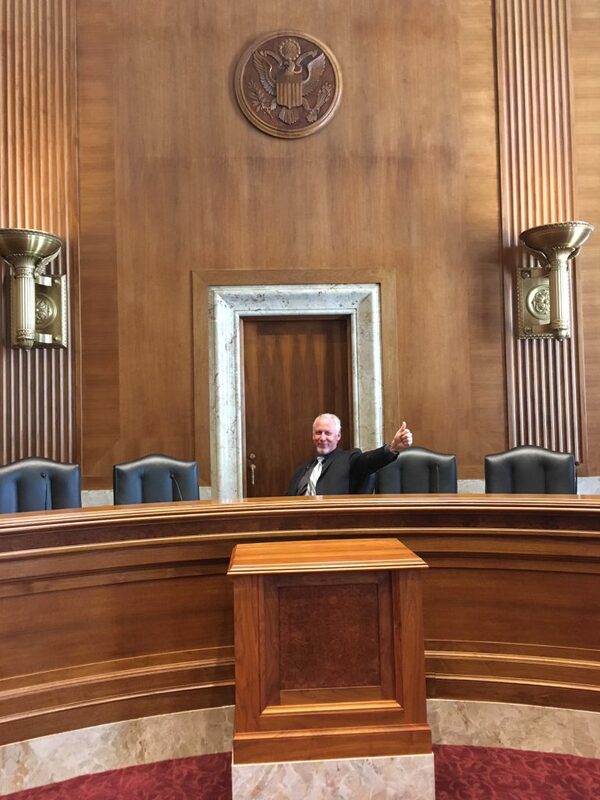 Here is Dr. Kjelgren at the Leshner training in the chair’s seat of the Senate Energy and Natural Resources committee meeting room. What is one thing you were surprised to learn about science communication and policy? That crafting a scientific message and format that can truly engage a specific audience is not easy. To do it well takes training, such as that provided by the Leshner program, practice, team work, and lots of thought. What do you see as the barriers of combining the area of policy with natural sciences like horticulture? Again, crafting a meaningful message, finding a venue for that message to be heard, and then being vigilant in listening to the response to that message. What do you think the future looks like with scientists getting more involved with policymaking? I distinguish policymaking from public engagement. Scientists with a knack and interest in advocacy can influence policy with appropriate training, and while related, advocacy is not the same as public engagement because it doesn’t necessarily involve a dialogue. What tools do you think are the most useful to communicate science? Seeing the world through the eyes of your audience so you never talk down to them. Do you think print (hard copy brochures, flyers) or digital media (Twitter, Facebook, Instagram, websites, blogs) have different impacts on your ability to communicate science? Or both? Both are tools in the toolbox that you use depending on the audience. What role do you think organizations like American Association for the Advancement of Science play with the policymaking? With industry? With scientists? AAAS’s mission is in part to educate scientists about communication and policymaking, so they play a fundamental role. The Leshner Leadership Institute is an initiative of the AAAS Center for Public Engagement with Science and Technology. Each year, a group of 15 public engagement fellows are chosen from different research areas to look at the relationship between society and science. This cohort meets for a week of intensive training covering the topics of science communication training and public engagement plan development.More information can be found here. For another UF/IFAS blog post about Kjelgren receiving the fellowship, follow this link.